Mom and World Hair Strengthening Conditioner is a versatile product that suits all types of hair including rough, thick, thin and dry hair. 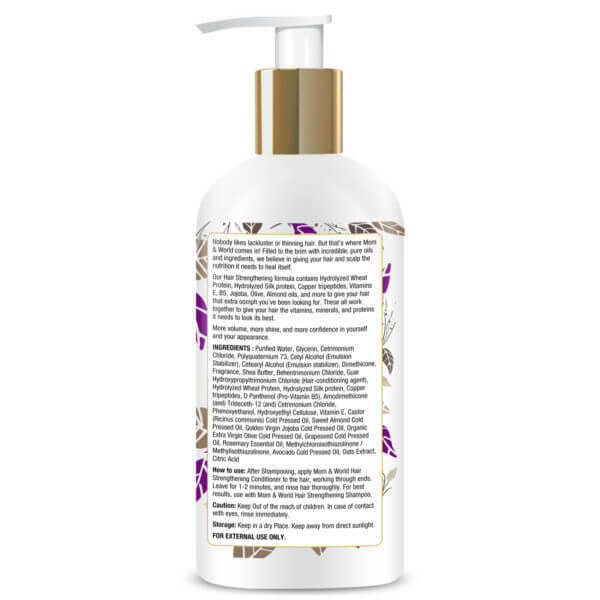 This Conditioner has oat extract and shea butter that are known to moisturize and tame rough frizzy hair. 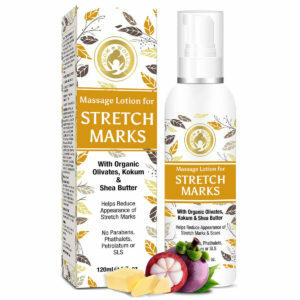 Enriched with organic oil, proteins, vitamins, and minerals helps to nourish, moisturize and protect hair from damage. This strengthening conditioner is free of sulphates, and paraben and can be used regularly by both men and women. Mom & World Hair Strengthening Conditioner is the perfect product for the damaged hair. The creamy texture of the conditioner helps in healing and repairing lackluster hair. The conditioner has hydrolyzed silk protein and wheat protein that make your hair smoother and thicker. The pure oils of jojoba, castor, almond, olive, and grape seed help improve the texture and shine of the hair. Applying the conditioner on the ends of the hair can keep your hair healthy and breakage-free. 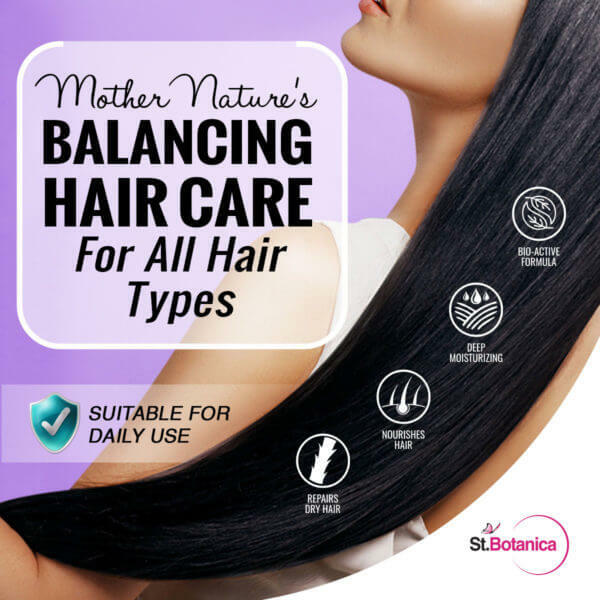 The product is manufactured by Mom and World which believes in providing chemical-free and organic products for people to keep their hair healthy. 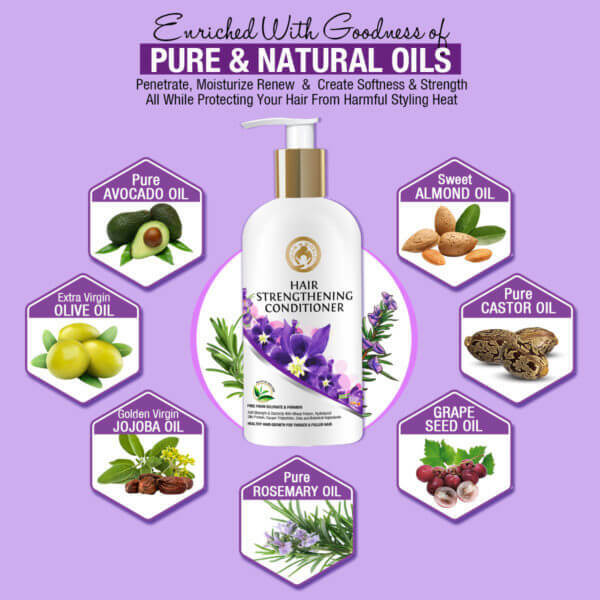 The conditioner has all the necessary proteins and minerals to nourish and condition the hair. It is known to suit all hair types. The product is perfect for everyday use to improve the thickness and volume of your hair. Using it regularly helps to reduce split ends and dry frizzy hair. 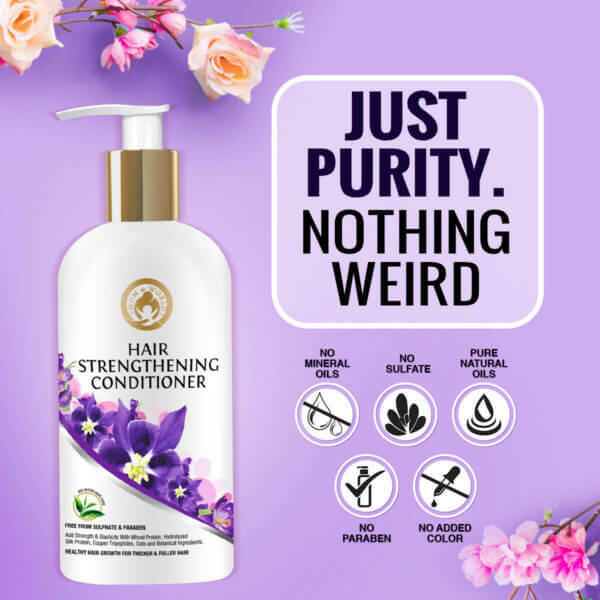 It is recommended to use Mom and World hair strengthening conditioner with Mom and World hair strengthening shampoo to see visible results within few weeks. 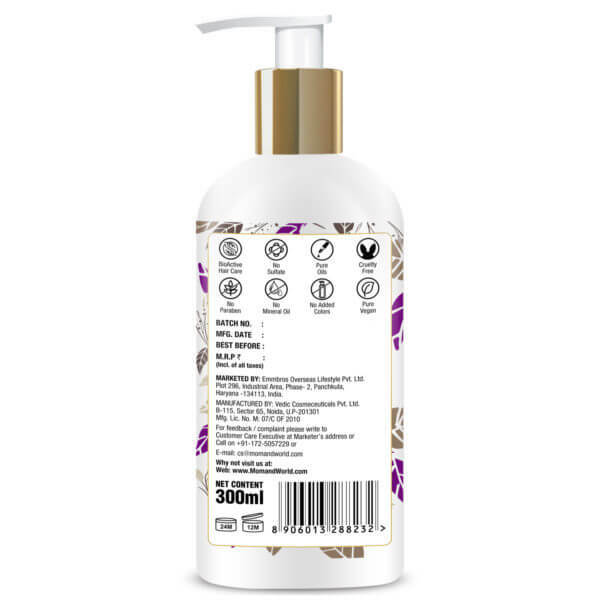 The product comes in a stylish pump bottle with 300 ml of conditioner that can last for more than a month. Everybody loves smooth, soft and luscious hair but everyday pollution and sunlight exposure can damage your hair. 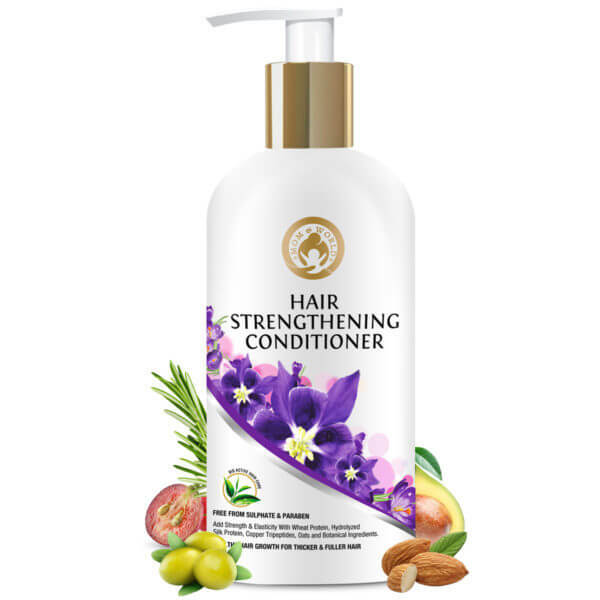 It is best to use a strengthening conditioner that is enriched with oils such as Mom and World Hair Strengthening Conditioner regularly to reduce hair loss and thinning of hair. It has no sulphates, paraben. 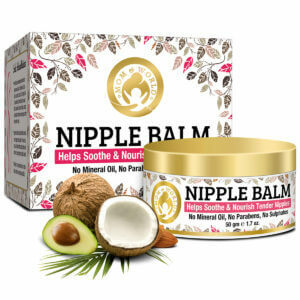 It is formulated using a blend of cold pressed pure organic oils, proteins, vitamins and minerals that help nourish, moisturize and improve the volume of hair. Hydrolyzed silk protein and wheat protein, carbon tri-peptides, vitamin B5 and vitamin E help in improving the structure and texture of hair while the organic oil such as jojoba, grapeseed, olive, almond, castor help keep the hair soft by reducing dryness. The conditioner can be perfect for keeping your hair tangle and knot-free. Applying 2 or 3 drops of conditioner at the hair tips and washing it thoroughly after few minutes could help in reducing split ends, dryness and breakage of hair. 1. DOES THE CONDITIONER HELP GET RID OF DANDRUFF? No, the conditioner can only moisturize and nourish damaged hair. 2. CAN I USE IT FOR DRY HAIR? Yes. The conditioner is a perfect product for hydrating and strengthening dry hair. 3. IS IT SULPHATE FREE? Yes. 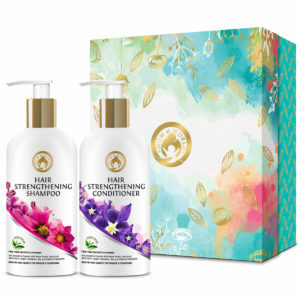 Mom and World Hair Strengthening Conditioner are free of sulphates and paraben. 4. HOW MANY TIMES SHOULD I USE THE CONDITIONER IN A WEEK? Use it two or three times a week after shampooing for best results. 5. CAN I USE IT ON COLORED HAIR? Yes. The conditioner is safe to use on colored hair as it helps repair hair from styling damage. 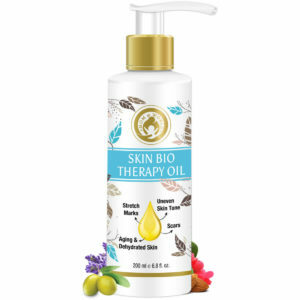 Hydrolyzed silk protein, hydrolyzed wheat protein, golden jojoba oil, olive oil, grapeseed oil, castor oil, carbon tri-peptides, vitamin B5, vitamin E, shea butter, oat extract, almond oil, rosemary essential oil and avocado cold pressed oil. Apply a dollop of Mom & World Hair Strengthening Conditioner on the tips of wet hair. Leave for 2 minutes and then wash off with lukewarm water. For best results, use Mom and World Hair Strengthening Conditioner after washing your hair with Mom and World Hair Strengthening Shampoo. This conditioner leaves my hair soft, smooth and silky. 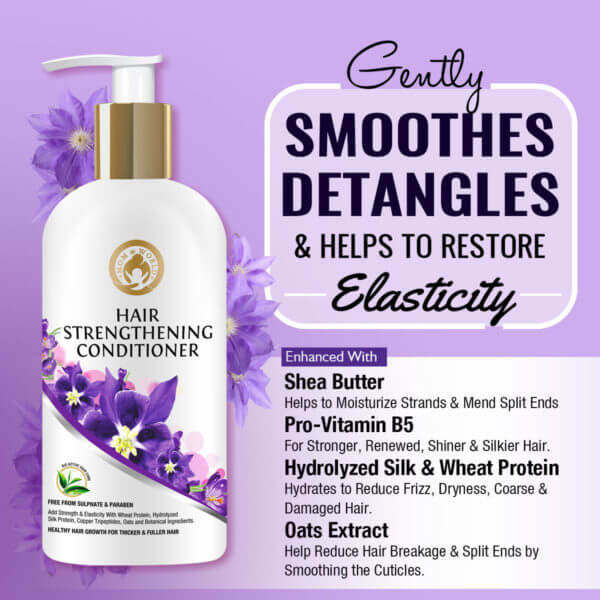 The creamy conditioner spreads easily and helps keep hair tangle-free.